I am not going to think about the fact that I have to fill a moving van in exactly two weeks. I am not going to think about how I am going to get my dissertation draft finished before then. I am not going to dwell on all the million smaller tasks that have to get done in the meantime. Instead I am going to think about my new Monkey socks, because therein lies courage. P.S. I don’t want it to be August. I like the monkeys! What’s the colorway? I don’t want it to be August either. Who allowed it to be August already? I need to have a stern discussion with them. This is going to be a stressful week. Don’t forget to put aside a chunk of time every day JUST FOR YOU! I think we should petition for a couple of extra weeks in this August, there is just too much to do this month!! August arrived shockingly early. Good luck with everything you have to do this week. That. colorway. is frickin’. gorgeous. The pink! The lilac! The BROWNS. 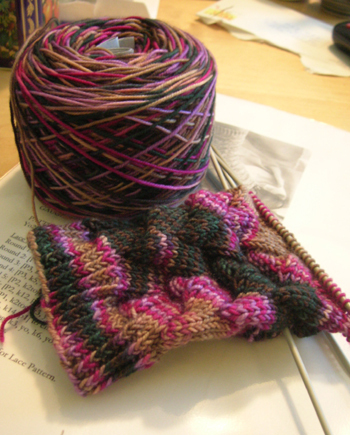 It reminds me of something… Monkey socks, monkey… the colors of a monkey with an orchid behind her ear? Now I won’t get that mental image out of my head all day. She has long eyelashes. Look after yourself and take plenty of time to relax. Moving is a stressful time and I bet having to do a dissertation is too! When it’s all over – book yourself a facial. Oh…did someone say ‘moving’? and ‘packing’? I feel for you, seriously feel for you, am in the midst of unpacking, then hows about a bit of remodeling for a month, then more packing and moving and unpacking? Can I come help you and let the rest of these folks take care of this? I will say it again, you make the very most divine cupcakes. Those are some really fun Monkeys! love the colours. ugh – moving stinks! I agree – smothering yourself in socks is a much better idea!